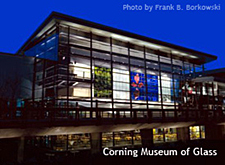 Opportunity Resources was hired to replace the long-serving Director of Corning Museum of Glass. He was a highly respected scholar in the field when he retired after a 20-year tenure. After our successful placement of the Executive Director/President, we were asked to fill four senior curator positions. The searches would need to bring the finest of the next generation of world-class experts to the premiere institution for the scholarship and exhibition of glass internationally. While active research, sourcing and recruitment are essential in any search, the best candidates for these very specialized positions would only be reached through the most extensive contact with our professional links and beyond. In each case, we were able to bring candidates with the highest level of talent and expertise to our client. Opportunity Resources conducted an extensive international search for CMoG’s director. In the end, the successful candidate was Dr. Karol Wight, Curator of the Getty Museum’s Getty Villa in Malibu and a renowned specialist in ancient Roman glass. Karol was on the senior management team for the Getty Institute and directed operations at the Villa, where she had spent most of her career. We were then engaged for the searches for Curator of American Glass, Curator of Modern and Contemporary Glass, Curator of European Glass and Curator of Science and Technology. Kelly Conway, a nationally recognized specialist in nineteenth and early twentieth century American glass, was appointed Curator of American Glass. Kelly was the Carolyn and Richard Barry Curator of Glass at the Chrysler Museum of Art in Norfolk, VA. Kelly began at CMoG in August, 2013. Susie Silbert was selected as Curator of Modern and Contemporary Glass. As an independent curator, writer and historian well known in the glass field, Silbert worked with institutions and arts organizations including Houston Center for Contemporary Craft, Museum of Fine Arts, Houston and the Metropolitan Museum of Art. Susie’s Master’s degree in Decorative Arts, Design History, and Material Culture is from Bard Graduate Center. Susie joined the Museum staff in April, 2016. Christopher Maxwell arrived in October 2016 as Curator of European Glass. Christopher held positions in the Royal Collection, worked as an assistant curator in the ceramics and glass section of the Victoria & Albert Museum, and worked with a private dealer in the UK and the US prior to joining the Corning Museum. Christopher’s PhD is from the University of Glasgow in Scotland. The Curator of Science and Technology, Dr. Marvin Bolt, brought an outstanding combination of world-renowned expertise in telescopes, scholarship in the philosophy of science, and enthusiastic hands-on interpretation of the concepts of science and technology for all audiences. Marvin began at CMoG in November, 2013. He came from the Adler Planetarium and Astronomy Museum in Chicago, where he was Curator of History of Astronomy and Vice President for Collections.